From its inception in 1885, the Alaska School Service was charged with the assimilation of Alaskan Native children into mainstream American values and ways of life. 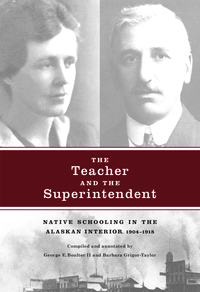 Working in the missions and schools along the Yukon River were George E. Boulter and Alice Green, his future wife. Boulter, a Londoner originally drawn to the Klondike, had begun teaching in 1905 and by 1910 had been promoted to superintendent of schools for the Upper Yukon District. In 1907, Green left a comfortable family life in New Orleans to answer the “call to serve” in the Episcopal mission boarding schools for Native children at Anvik and Nenana, where she occupied the position of government teacher. As school superintendent, Boulter wrote frequently to his superiors in Seattle and Washington, DC, to discuss numerous administrative matters and to report on problems and conditions overall.From 1906 to 1918, Green kept a personal journal—hitherto in private possession—in which she reflected on her professional duties and her domestic life in Alaska. Collected in The Teacher and the Superintendent are Boulter’s letters and Green’s diary. Together, their vivid, first- hand impressions bespeak the earnest but paternalistic beliefs of those who lived and worked in immensely isolated regions, seeking to bring Christianity and “civilized” values to the Native children in their care. Beyond shedding private light on the missionary spirit, however, Boulter and Green have also left us an invaluable account of the daily conflicts that occurred between church and government and of the many injustices suffered by the Native population in the face of the misguided efforts of both institutions..